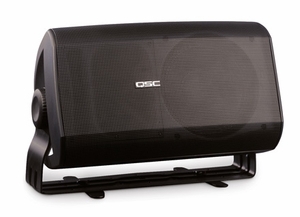 The QSC I-82H is an 8-inch, 2-way, full-range loudspeaker with contemporary styling that integrates into multiple environments. With the ability to be pole and mic stand mounted, truss mounted, or used as a floor monitor / stage fill, these injection molded speakers are an excellent choice for musicians, mobile entertainers, and others needing a high-quality, lightweight SR package that sounds great, is visually unobtrusive, and with its built-in handles, is easy to transport. The I-82H enclosure incorporates an 8" weatherproof, LF transducer with a heavy-duty double roll cloth surround and a 1" exit HF compression driver. The HF driver is coupled with QSC's unique Advanced Directivity� Rotatable Waveguide - enabling the loudspeaker to deliver accurately focused sound, regardless of its orientation. For quick and secure input setup, the I-82H provides two parallel Speakon� connectors. An ideal solution for a variety of mobile SR applications, the I-82H includes a pole cup bracket for pole mount applications as well as a 5/8"-27 mic stand adapter that fits most mic and boom stand hardware. With the addition of QSC's new, optional I-YM8 Yoke Mount / Floor Monitor Kit (which contains a bracket with swivel extension feet), the I-82H can be horizontally pole mounted for pan and tilt focusing or used as a floor monitor. For truss mounting, the I-YM8 accepts most industry standard truss clamps. 8 inch, 2-way System - in a lightweight, weather-resistant, multipurpose enclosure featuring a heavy duty, powder coated steel grill. Advanced Directivity Rotatable Waveguide -(90� x 60�) enables the loudspeaker to deliver accurately focused sound, regardless of the enclosure's mounted orientation. High Power Capability with Dynamic Protection - rated at 240 watts (IEC) with power protection circuitry to prevent overloads. Contemporary Style, Weather Resistant Enclosure and Components - ideal for a wide range of applications. Two Parallel Speakon Connectors - for quick, secure audio input setup. Pole Cup and Mic Stand Adapters - included for versatile mounting options.